What Does it Take to Launch a Custom LMS? Truth be told, you really don't want a custom piece of software as your custom LMS. While it sounds great on the surface, the truth is that custom software is expensive to build, expensive to maintain, and never work as well as a commercial product. This is why when I hear learning professionals say, "We want a custom LMS," I know that what they really need is an LMS built on a website platform that can help them manage training courses, manage eLearning content, maintain trainee accounts, and generate training records. All of these functions are possible with an LMS built on a platform like WordPress or Drupal. Either of these open-source Content Management Systems (CMS) will work for most organizations looking for a custom LMS. The benefits of using an open-source CMS is that they have a tremendous amount of community support behind them helping keep them in fighting trim making them a solid platform for building a custom LMS. Assuming most organizations will select an open-source CMS like Drupal or WordPress, the development of a custom LMS will be a relatively straightforward web development project. However, most business professionals have never participated in a web development project and so may not be aware of how these projects are structured, how they flow, and where some of the potential pitfalls are. What does a successful web development project look like? Amazingly enough, the process for building a website looks very similar to the method for producing a training solution. When I first learned about web development, I remember thinking that the underlying process mapped very cleanly to the eLearning development process of ADDIE (Analyze, Design, Develop, Implement, Evaluate). We’ll use ADDIE as a means to help put the activities of a web development project in context for folks more attuned to eLearning project lifecycles. 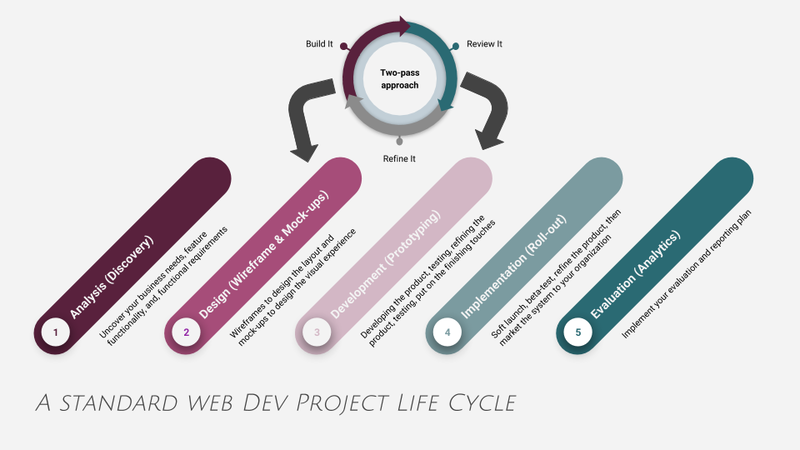 This process diagram of the standard web development project lifecycle is presented from the perspective of ADDIE: Analyze, Design, Develop, Implement, Evaluate. ADDIE is the go-to project lifecycle for instructional design, but learning professionals will adopt the life cycle to fit their needs. In this example, I've used it to diagram the life cycle of a website development project. As you can see depicted by the circle at the top, the "Design" and "Development" phases go through two iterations. You can easily add more iterations to this process, or you can set up an Agile organization to continue developing feature functionality on an ongoing basis. Once the discovery phase of your custom LMS project closes out, your web development team will guide you through a design phase. The design phase of your project will produce two critical deliverables that will shape the user experience of your custom LMS: the visual design and the information design. For those new to the world of web design, the visual design is the look and feel of a website. The color pallet, fonts, image treatments, typography, and several other details are part of the visual design. Argyle Analytics advocates the use of "Style Tiles" as a design deliverable to help facilitate client conversations. "What are style tiles?" you may be asking, well for that I would like to reference Samantha Warren. Trained as an instructional designer, Samantha now works as the Design Director at Phase2 Technology. In her post on A List Apart titled Style Tiles and How They Work, Samantha shares her definition of a style tile. I highly recommend reading Samantha's post since it will give you a sense of how web designers see the visual design and the role it plays in the creative process. A word to the wise about visual design, don't blow your budget on this phase of the project. I've seen numerous clients get hung up on this aspect of their web development project and each time they needlessly eat up their budget. Branding and brand cohesiveness is essential, but the last thing you have time for is to get into arguments over color tones. If your company already has a style guide for the web that lays out all your digital branding standards for how your website looks, then I highly encourage your team to stick to those standards. You don't want to burn your project budget arguing over different shades of blue when you need to spend that budget on the more advanced features your custom LMS can offer you. "The time spent on any item of the agenda will be in inverse proportion to the [importance of the topic]." Parkinson would predict that committee will first gloss over the plans for the train station even though the placement of the station will have far-reaching economic and environmental implications for the village. Second, the committee will allocate slightly more time to discussing the construction of the bike shed concerning its construction materials, the visual design, and even the need for a bikeshed at all. Finally, the committee will spend the most time and attention will be spent on the plan for supplying refreshments to the station break room because everyone understands snacks and coffee and is an expert on this topic. In more than a decade of consulting, I've seen numerous clients bikeshed over trivial issues and ignore the bigger issues. Most project teams are unaware of when they are bikeshedding and psychologically resist having it pointed out to them. Do not fall victim to this blind spot and hamstring your project. The information design requires critical thought and analysis, not just emotional responses. Often, where I see clients fall victim to the bikeshedding problem, is when we start working on the information design of a website. Rather than focus on layouts, the priority of specific information, considering a strategy for automatically suggesting related content, they focus on colors and fonts because they can react to those with little effort since the visual design is all about emotional reaction. Information design is also something that many web developers gloss over as well. Contrary to popular belief, most web developers are not going to know everything about pulling together a website. Just as with medicine and doctors, web development has many different specialties. Most small-time jack-of-all-trades web developers will be more attuned to the technical details of your website or more attuned to the visual design. It's a rare few who can coax a strategy out of a client and turn that strategy into technical specifications that speak to layouts, block configuration, sensible navigation, and a host of other technical details that meets the needs of your website users. I attribute the lack of attention to information design to an issue with how people think about websites; we don't think about them in general. Oh, we consume sites, but as one of my associates quipped in response to this issue, "I love consuming chocolate croissants, but I couldn't make one to save my life." This is why a good information designer, or "wireframer" as web devs may describe them, will use tools that allow them to mock up the website in a tool that will let you click around a "paper prototype" and get a sense for how trainees will navigate, search, and complete training in your new custom LMS. Paper prototyping is a colloquial term for developing low-fidelity sketches or "blueprints" of the layouts of different pages of your website. Often your "paper prototype" is ginned up in a UX tool like Balsamiq or it can use index cards and printer paper. Turning to A List Apart for another definition, author Matt Griffin describes wireframing in his blog post titled Start Coding with Wireframes. When reviewing your wireframes, pay careful attention to the titles of things, the header navigation, and how the wireframer labeled different elements. Also pay attention to the elements that will dynamically display content. Each one of those dynamic elements will have logic the drives what links, images, or content the element displays. Make sure you understand the logic and that the thinking is trainee-centric vs. what you feel should be important to the trainee. One final word of wisdom on the topic of wireframing, if you don't understand something, then ask the question because once you sign off on the visual design and the wireframes, changes to your website become very expensive. During development is when you will see your new custom LMS come to life as a website. You need to moderate your expectations a bit because of the first "draft" of your website will look very "draft" when you see it. Your custom LMS will look "in process" because web developers want to iterate on things quickly and they know the client will change his or her mind at least once or twice during this stage. As such, they want to get your reactions to things when they look half done because your reactions will inform what "done" really means. The first pass on your website will be a bit rough for you, but fear not, for a good web development team will include you in this process and solicit feedback from you. On your side of the table, you will probably need to collect input from a variety of people and so having a single point of contact to coordinate the review and feedback is essential. That single point of contact, with guidance from the project team, should summarize and communicate that feedback to the development project manager. From there, the project manager will negotiate what feedback is legit, what is merely a reaction to something that's still in progress, and what constitutes a change request or a scope amendment. The second pass over your custom LMS is where you will need to finalize all your testing and review since once the developers finish their work, you will be ready to roll out the site. It's on this second pass that I sometimes see clients lose steam. Project fatigue and burnout is a genuine risk, but sadly there's not a lot that your web development team can do to help you overcome this. Project fatigue on a custom LMS project is normal, but the risk at this stage is that your team may fail to test a critical feature adequately and when that feature fails during your rollout then your whole team's credibility is shot. Don't lose your focus at this point, or something will come back to bite you. Web developers will sometimes call this phase "launch" or "rollout," and this is when all your hard work pays off. Your rollout will be a rather sedate affair if everything goes according to plan; it can feel very anticlimactic. However, launches that lack a very carefully scripted rollout plan can be more exciting than you want them to be. For this reason, I recommend you stage the rollout of a custom LMS in waves. In the first wave, rollout your custom LMS to a small group of beta-testers. The beta-testers should have a testing plan to help identify all the little issues that your team and the web development team can't see because your team is too far into the weeds to see what fresh eyes would consider obvious. The second wave in your rollout should include a slightly broader group of trainees, the makeup of this slice of trainees is less critical since they should not find as many issues. However, at this point in the setup of the system, you should have a support function organized that can field help requests from your trainees. During this stage of your rollout, you need to carefully catalog and analyze your help requests since they will help you identify potential user experience changes to consider addressing in the future. Your rollout schedule also needs to account for the loading of content into your custom LMS. Oh yes, let's not forget about the eLearning content you need to serve up through your custom LMS. During your implementation, you need to designate a team member to supervise your content migration from the old system to the new system. During the design and development phases of your custom LMS, your team needs to organize around a significant content migration project. Your web development team can help you identify the technical requirements you need to consider when it comes to developing eLearning content for the new system, but it's your job to make sure your training content will meet those requirements. Some clients will push for the system to accept all the extant courseware as-is, which is understandable, but you should also develop a schedule for course redevelopment where your instructional designers establish new eLearning get's as native web content directly in your LMS. A content migration of this magnitude is no small feat and warrants it's own post to help you consider the implications of such a move, but for this article, you should count on supervising a significant content migration effort. Evaluating the performance of your new custom LMS is essential, but the standard Kirkpatrick Four Levels of Training Evaluation were developed before CMS technology even existed, so there isn't a good standard in the training and development world for evaluating the performance a custom LMS built on something like WordPress. The good news is that you can rely on the advice from the Center for Talent Reporting (CTR). Argyle Analytics is an ardent advocate of CTR standards because of their origin. A former Chief Learning Officer of Caterpillar University founded CTR to help establish standardized metrics and reporting standards for the Human Resources and Training functions at major corporations. The lack of standardization of best practices in the training field has been a thorn in my side since I started in this field so naturally, I was thrilled to discovery CTR, and now I fold their work into just about every project where I've been able to convince the client it invest in evaluation work. I highly recommend registering for some of their webinars if you are new to the world of training evaluation or are looking to help your organization level-up its training evaluation efforts. There are plenty of standardized metrics you can apply to evaluating your custom LMS and CTR even offers consulting services to help you develop a measurement plan, but, Argyle Analytics can also deliver your measurement plan if we are lucky enough to help you develop a custom LMS. Older PostIs Your Company Ready for a Custom LMS? Author & Principal Analyst at Argyle Analytics.